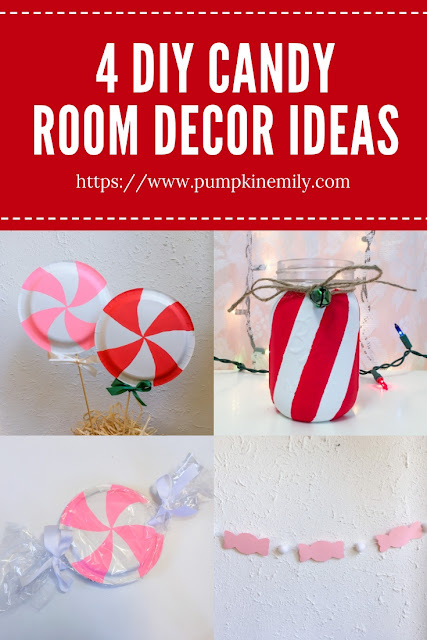 In the video and in this blog post I'm going to show you how to make four DIY candy room decor ideas that can be great DIY Christmas room decorations or they can be great decorations for a party. 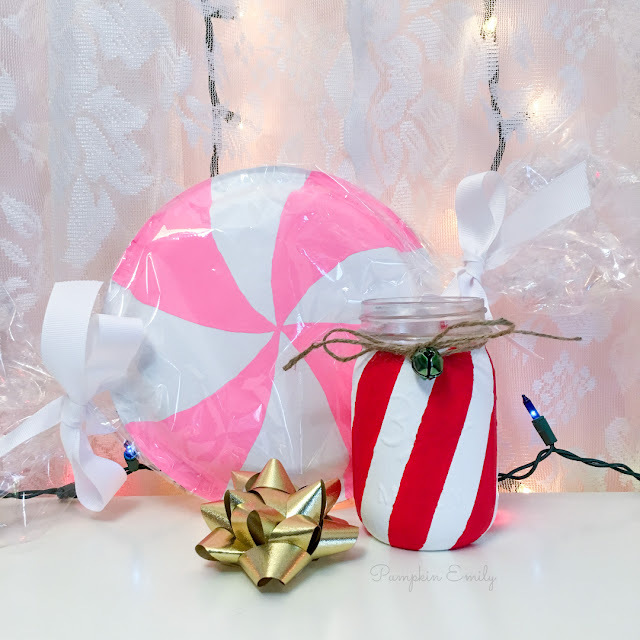 I'll be showing how to make paper plate candy decorations in two different ways, a candy banner and how to make a candy cane mason jar. In the comments down below let me know which DIY is your favorite. My favorite is the candy cane jar. 1. Paint a jar with one or more coats of acrylic white paint and wait for it to completely dry. 2. 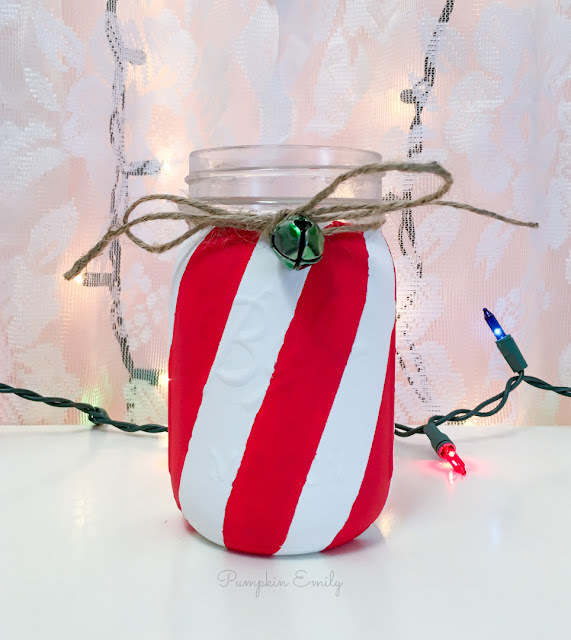 When the paint is dry you can take some tape and you want to tape stripes at a angle on the side of the jar. I used invisible tape but you can use something like washi tape. You want to do this all the around the jar. 3. Paint each stripe where there's no tape with red acrylic paint and you want to wait for it to dry before peeling the tape off. 4. When the red paint is dry you can carefully pull off the tape. If some of the red paint got under the tape or if some paint came off when you pulled off the tape you can go back and clean up the lines with white or red paint. 5. Once the paint is dry you can tie a piece of twine or a piece of ribbon onto the jar and then if you want you can stick a bell onto the twine or ribbon and tie a bow. 1. 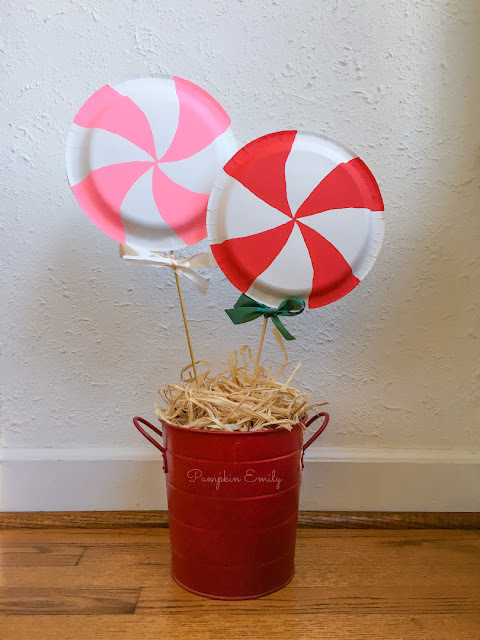 You want to take the paper plate you want on the front of the lollipop and place a dot in the middle of the back of the plate. 2. Drawing curved lines from the center of the paper plate to the edge of the paper plate to make stripes. You want to make eight stripes. 3. Paint every other stripe with any color of acrylic paint. 4. When the paint is dry you want to get a second paper plate and a barbeque stick that's cut down to the size that you want and you want to put some hot glue on the front edge of the second paper plate where you want the stick to go. Then you want to place the stick in the glue and wait for the glue to dry. 5. 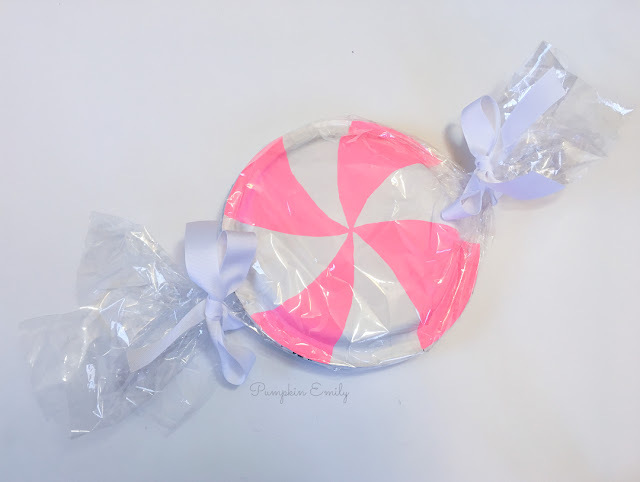 Once the glue is dry where the stick is you want to put a line of glue on the whole edge of the second paper plate and then you can place the painted paper plate on top of the glue and you want to wait for the glue to dry. 6. Tie a bow onto the stick and you're all done. If you used colored paper plates and if you can see the one in the back you can trim the back paper plate. You can put these anywhere that you want. I put them in this red bucket with a piece of floral green foam and some raffia. 1. 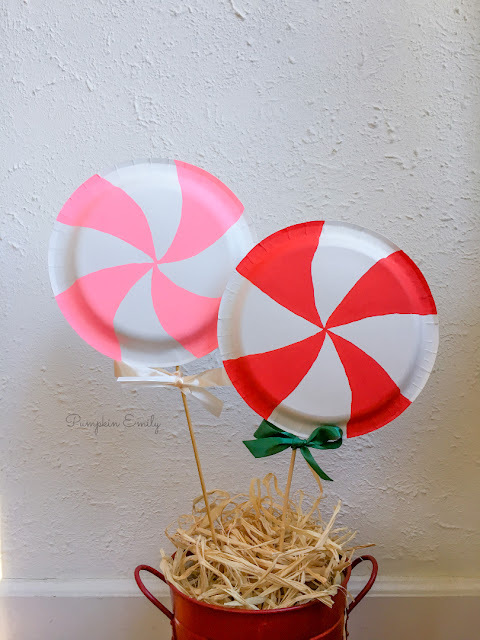 You're going to want to follow the same steps as the lollipop for the front paper plate which is drawing on the eight stripes and painting every other stipe in with any color of paint. 2. When the paint is dry you want to get a second paper plate and put some hot glue on the edge of the plate and then you can place the striped plate on top. 3. When the glue is dry you can place the plates with the front side facing down on a piece of cellophane wrap that's big enough to wrap the plates and some extra on the sides of the plates. 4. Then you can wrap the plates and you can tape the opening shut on the back of the plates so the plastic stays in place better and make sure you keep the plates in the middle. 5. Tightly tie a piece of ribbon on both sides of the plates and you're all done. 1. 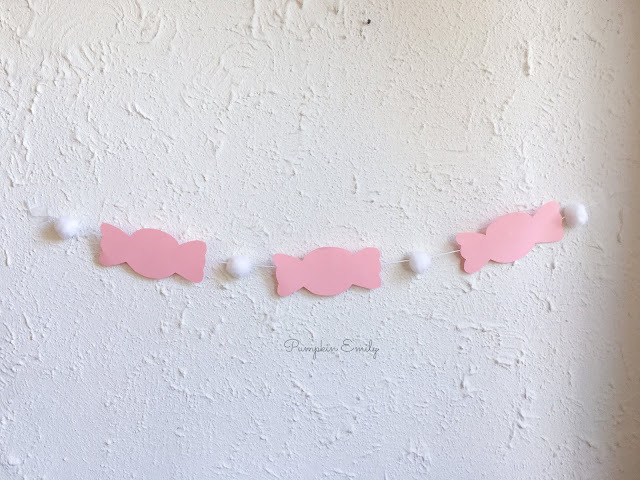 Cut out a candy template of any shape and then you want to trace it onto any color of cardstock paper. 2. Cut the candy out. 3. After you're done cutting out your candy you want to put any color of thread onto a needle and then you want to run the needle though any color of pom poms and move the pom poms on the thread. You can put as many pom poms as you want on the thread. 4. When you're done putting the pom poms on the thread you can move the pom poms apart so there's some room for the candy to be. 5. Lay the candy on the thread and tape the candy on the thread in between the pom poms. 6. Tape it onto the wall or somewhere else and you're all done.